Inclusive early education and skilled nursing care for preemies, babies, and toddlers. Medical daycares in Georgia: where did they go??? What happen to all the medical daycares in Georgia??? Great question! 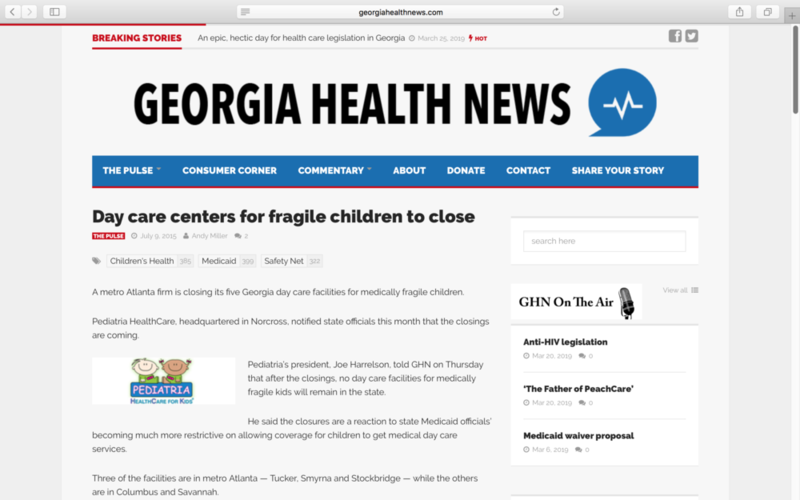 There were many “medically fragile daycares” aka PPECs (Physician Prescribed Extended Care) centers in Georgia in the past but they all closed their doors around 2015. It turns out that from 2012 to 2015 Medicaid decreased how many children it approved and how much it would pay for the care provided per child. The businesses just couldn’t survive without enough children to care for and enough compensation for the overhead. The most well-known companies that closed centers, PSA and Pediatria, both still provide private duty nursing to children in their homes in Georgia. You might think, “How wonderful, the families can get nursing care in their own home!” But unfortunately the Medicaid approval for number of hours-per-week of nursing care is extremely variable. Often the hours must be fought for in court, and even then families often do not get enough nursing hours approved, leaving parents stranded. PSA and Pediatria still operate thriving PPECs in other states, and rumor has it that a bigger company called Aveanna has started buying them out. Who knows if Medicaid might change in Georgia to allow these centers to re-open at some point. All I know is that it is now 2019 and for 4 years there has been NOTHING… except my Harmony in-home babysitting and respite care services since 2017, but it’s not enough. We need to open a childcare center for these families!!! SO, I’m ASKING FOR YOUR HELP! please just CLICK THIS LINK to give your support! when the voting closes. Then we cross our fingers that FedEx got enough votes to put Harmony in the running for up to $50,000. There are smaller prizes too, but let’s aim to WIN! (unfortunately the video isn’t working on the FedEx contest site). Thanks for being part of the village! *The facts stated here are to the best of my knowledge, and I’m happy to change given facts if other validated information comes to my attention. What's Rare Disease Day and how can it support babies with medical needs and their families? Just kidding, no it’s not… but NEXT year there will be a leap day on 02/29/2020, so hold on to your zebra stripes because it’ll be even more fun to celebrate Rare Disease Day every leap year! 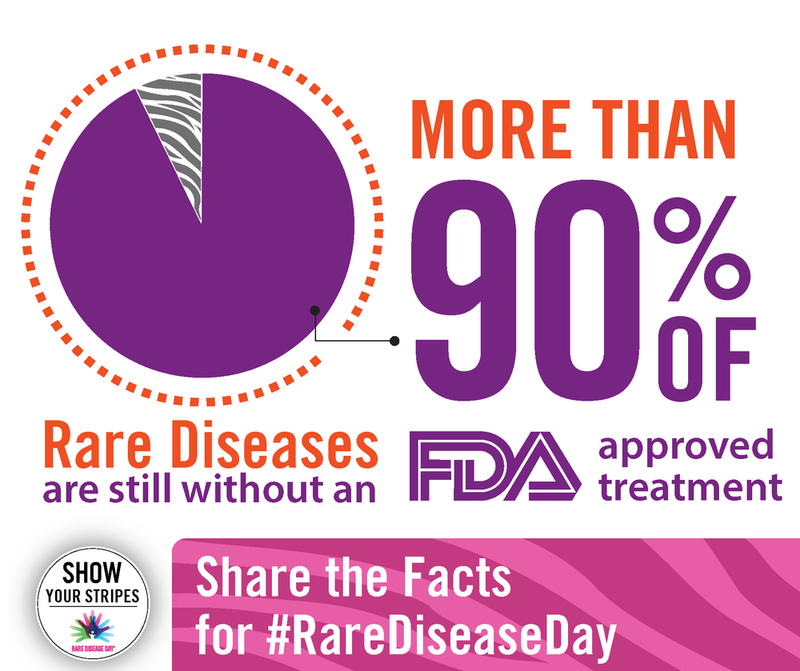 Another Fun Fact: Rare Disease Day became a thing to raise awareness because the families devastated by these diseases desperately need more research for treatments and cures. Compared to more common conditions there’s MUCH less funding for research, treatments and cures. While rare diseases affect fewer people than other conditions the severity of their impact deems them worthy of funding. Due to the rarity and diversity of rare diseases, research needs to be international to ensure that experts, researchers and clinicians are connected, that clinical trials are multinational and that patients can benefit from the pooling of resources across borders. The first Rare Disease Day was celebrated in 2008 on 29 February, a ‘rare’ date that happens only once every four years. Ever since then, Rare Disease Day has taken place on the last day of February, a month known for having a ‘rare’ number of days. On rarediseaseday.org you can find information about the thousands of events happening around the world on the last day of February. So at Harmony Children’s Village we will raise awareness by wearing black and white stripes every February 28th and on leap years on February 29th! One rare disease close to my heart is called Epidermolysis Bullosa (or EB). EB has been appropriately coined “the worst disease you’ve never heard of,” because essentially the body’s protein that acts as the glue keeping your skin stuck together has a genetic defect making it weak. The result is constant wounds all over the person’s body and also issues through their gastro-intestinal tract because it effects the epithelial cells. There’s no cure and there’s no proven treatment to help people with EB, so all they can do is apply wound dressings all over their bodies to heal and protect their skin as best as they can. Through Harmony I want to help more families like the Tavani’s find balance in their lives. Please like and share this post with your circle of friends so families that need Harmony Children’s Village can find us! 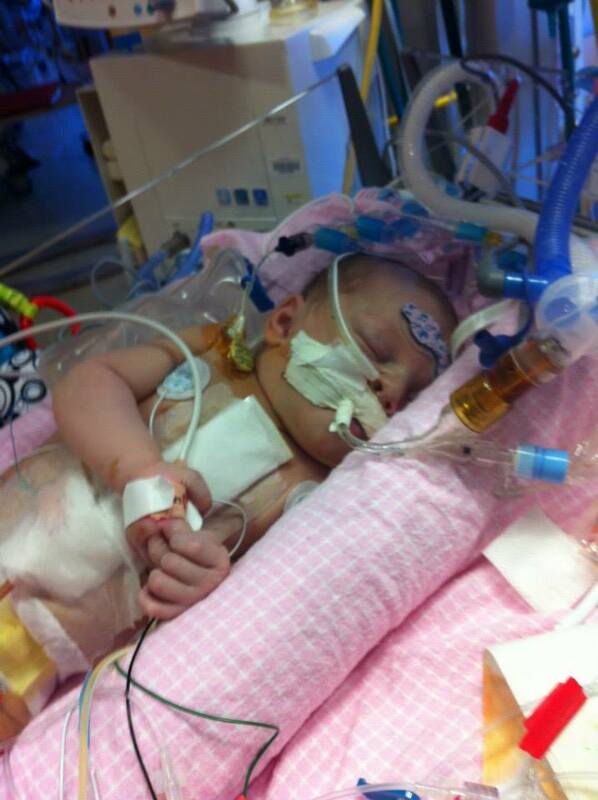 What do families do when their baby has cardiac abnormalities? They take things one day at a time. They pray a lot. They find support. February, more commonly known for romantic gestures and heart-shaped chocolates also celebrates miracle babies born with Congenital Heart Disease (CHD). So I would like to share one family’s story to illustrate why CHD gets a special month to spread awareness. This sweet family just celebrated their heart warrior’s 7th birthday! 2018 photo of this amazing Heart Warrior, Abby, and her two younger sisters, Caroline and Lilly (left to right). “Your baby has a congenital heart defect that we need to identify.” These are the words you can’t prepare yourself for when you’re excitedly expecting your first child. But they’re the words Mark and Natalie Kirkley heard in 2011 after being married for just a few short months. Upon further specialist appointments, tests and ultrasounds they discovered more medically complex information-- their baby’s specific diagnosis was Heterotaxy. It’s a condition that involves more organs than just the heart. “Hetero-,” meaning different, and “-taxy,” meaning arrangement, describes how the heart and other organs within the chest and abdominal cavities are rearranged atypically. Once the surgeon was able to examine her unique physiology he explained more specifically how her heart, stomach and intestines were situated out of the usual places, and he said it was all connected in a way he had never seen before. Proud parents admiring their beautiful baby girl, Abby, in 2012. 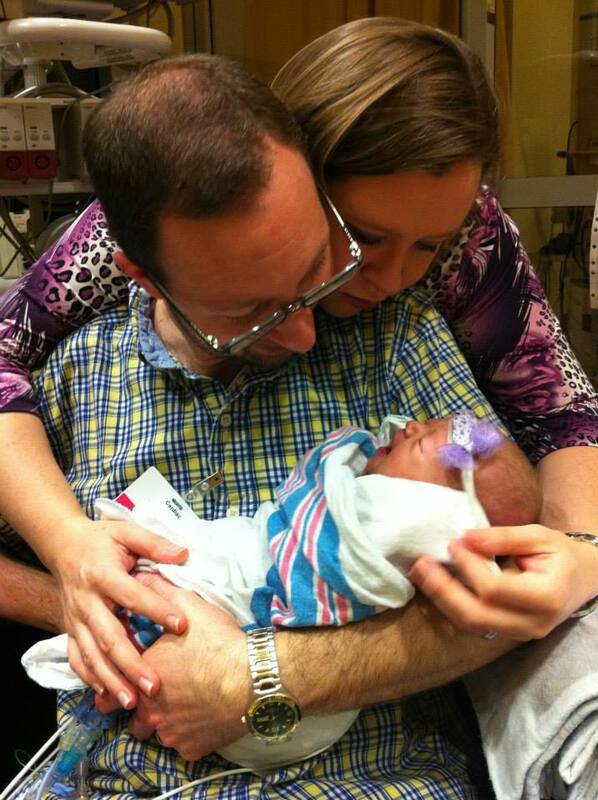 Natalie and Mark prepared for the suggested medical course to have Abby taken via medical transport to Children’s Healthcare of Atlanta immediately after she was born for heart surgery. She was stable upon entering the world, but she needed medical attention from her first breath, unable to go home for the first 2 ½ months of her life. Mom, Natalie, with Abby during one of their many days spent at Children’s Healthcare of Atlanta, Egleston. Since that wonderful day in 2012 these loving parents have relied on their faith, family and friends for the strength it took to endure all the challenges they faced. All in all Abby has had 2 PICC lines, 4 heart lines, more than 10 PIV’s, and 6 surgeries-- 4 on her heart, and 2 for placing and then removing a feeding tube into her stomach. She’s also had additional hospital stays since then, including one for 3 weeks in Boston where she was treated by Heterotaxy specialists who inserted a pacemaker for her heart. When she was ready to go home for the first time she needed oxygen, several medications and a G-Tube for her nutrition (rather than eating everything by mouth). She could not go to a regular childcare. Abby with a breathing tube in her mouth, wires to monitor her vital signs, a sticker on her head to monitor her temperature, and central venous access lines to give her medications, fluids and intravenous nutrition. Despite how hard it was, this family was very lucky. Many parents who have similar situations cannot avoid sacrificing one of the parent’s careers in order to care for their child with medical needs. Natalie and Mark are part of the village because they believe in our mission to support families like theirs to have better balance in their lives. 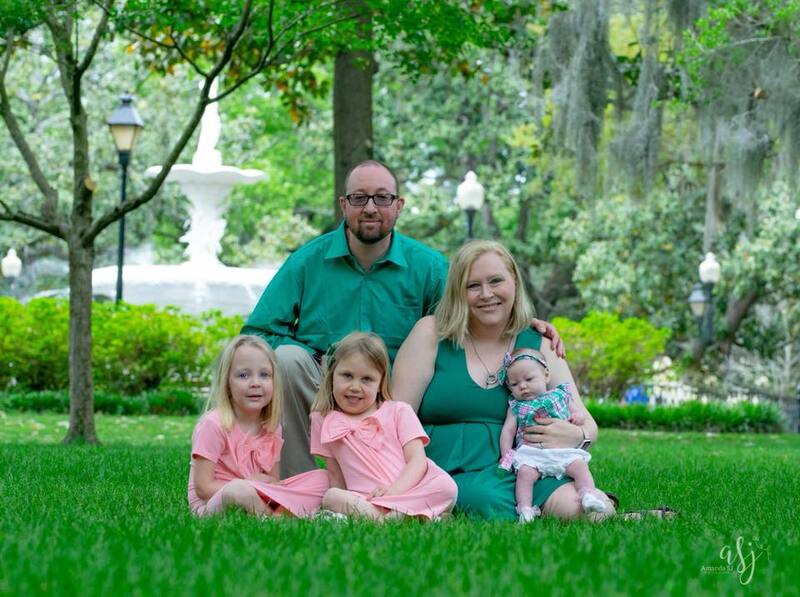 Kirkley Family heading to Boston to see specialists for Abby, bringing along their second daughter, Caroline when she was just a few months old. So this February, and annually, we celebrate heart warriors like Abby! She continues to be a smart, sweet girl and we are proud of how bravely she faces her lifelong journey with CHD and Heterotaxy! Valentine’s Day gives us an opportunity to remember all heart warriors and their families who do so much to keep them safe and healthy. At Harmony Children’s Village we can’t wait to be a source of support and love for other heart warrior families! What miracle babies inspire you? Please comment here or email me at lilly.pulko@harmonychildrensvillage.com with stories you want to share! To my friends, Mark and Natalie— I appreciate the opportunity to share your beautiful story and precious photos! Thank you for being one of my inspirations, and for your whole-hearted support of Harmony! How can I live in the moment? How can I "live in the moment" when there’s so much to do??? It is a wonderful ideal that I think most parents strive for, but no matter how hard we try there's always something else on our minds: the laundry, the next appointment, bedtime, work deadlines, family obligations... and the list goes on. But the cliché is true that our children are only little for so long, so I've found myself trying harder and harder to block out my multitasking mindset. I'm really trying to live in the moment with my new baby, Eloise, my five-year-old, Violet, and my eight-year-old, Jane. It's pretty magical to hear their giggles and listen to their imaginative ideas-- even if the giggles are usually about fart jokes and their ideas lead to messy projects in the kitchen. Even with my ambitions with Harmony Children's Village, I am embracing this stage in life both with my family and in my career. Things may be moving a little slower than I had envisioned but I am so thankful that Harmony Children's Village has not only brought some very special families into my life, but also given me the flexibility to have play dates for Jane and Violet and make memories of Baby Eloise sleeping sweetly in my arms. Yes, being a Mom-preneur takes a lot out of me, but I am happy with where my family and my business are right now. Don't worry, Villagers, I'm still searching for the perfect location and working towards being open full-time! To all the families out there, especially those facing their child’s medical challenges, I hope you're able to embrace your current stage in life however difficult it may be. Hopefully it's a short phase that brings unexpected blessings your way. If you or someone you know is in a stage of life when they need part-time respite care for their baby please reach out to me. It takes a village y'all! How do you live in the moment? Please share your experience by commenting here or email me at lilly.pulko@harmonychildrensvillage.com with your ideas! Thanks for being a part of the village! Recently I messed up our schedule and my daughter missed her only chance to get professional ballet photographs in her recital costume. It’s honestly not a big deal to me. However, to my theatrical seven-year-old it’s a catastrophe! 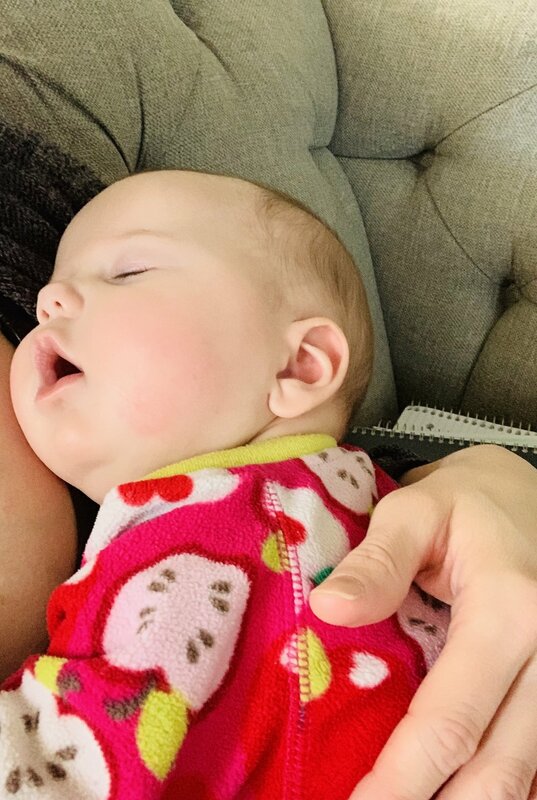 Part of me feels really guilty, but the guilt is less about this one scheduling mix-up and more about my everyday struggle to keep our family organized. Perfection is an impossible ideal, but somehow it is still something we aspire to be. We want to be “Super Parents” that can “do it all!” While we know there’s no such thing as perfect parenting we seem to worry a whole lot about what isn’t perfect. With kids we can’t always be on time, or have all the laundry done, or go to every birthday party. Bedtimes are variable, baths get skipped, homework is forgotten, and somehow everyone survives. Why worry so much??? Why expect perfection??? In my experience the “mommy guilt” I put on myself is usually from an unrealistic expectation, not a true failure on my part. Even if I make an actual mistake that I must fix, like apologize for overreacting to my children, I believe the apology a good lesson in itself. It occurred to me recently that I need to be kinder to myself, I need to worry less, and I need to consciously shut off the “mommy guilt.” Because what does it teach our kids when we ruminate on our imperfections? What if they pick up on our obsession to be “super” at everything, and what if they think we expect them to be perfect? If we can’t forgive our own imperfections how do we teach our kids to forgive themselves when they fall short? To all the parents out there please give yourselves a break! The reality is that being a “super” parent isn’t about being perfect. In my opinion it’s about being loving, consistent, and forgiving… and sometimes admitting that we are regular humans who can’t “do it all” all the time. “Better beginnings, better balance,” is our catchphrase at Harmony Children’s Village, and balance is another thing that we can’t get perfect. Like most other parenting challenges it’s something to work at every day. So the next time you’re late tucking the kids in bed or digging through dirty laundry for the shirt your child needs, just know your’e not alone and remember to go easy on yourself! I’ll be doing the same. How do you cope when you can't "do it all" as a parent? Please share your insights by commenting here or email me at lilly.pulko@harmonychildrensvillage.com with your thoughts and ideas for more blog topics! Creativity really is essential in parenting. I'm not talking about decorating a magazine-worthy nursery or crafting hand-made Valentine's cards for all 22 of your preschooler's classmates. I'm referring to creativity like making a peek-a-boo game with your restaurant menu when your toddler is hangry. Keeping a couple of treats in your car (like gummy fruit snacks) for when you need to incentivize your kid to be patient on errands. Arranging your 4 year-old's closet and drawers so it's fool-proof for her to put away her laundry (I'll let you know if this actually works in the next blog post). Some of these "life hacks" give us a little more sanity and we only discover them by talking to each other and bouncing ideas off of each other. I bring this up because it has become more meaningful for me to reach out to the parents of my daughter's friends. These other moms and dads have helped me with behavior issues, carpool, homework, social dilemmas, and all sorts of stuff. I'll admit that as an inexperienced mom I thought I was too busy with my every day priorities to make room for other people in my life. It's already a struggle to spend time with my closest friends because most of us have kids and our schedules are impossible! However my ability to ask for support and find support has exponentially grown by finding a couple of other parent friends in my daughters' social circle. One of the things that weighs on my heart for families who have children with medical conditions is how they often become socially isolated and don't get to meet as many other parents as the rest of us, especially not in person. Many of these parents cut their work hours or even give up their careers, they may not be able to find or afford qualified babysitters, and going out with their child becomes complicated in and of itself because of all the medical stuff they have to bring. Did I mention how many doctor's and therapist's appointments they have on their schedule too? What are some of your favorite creative life hacks??? Please share them here or email me at lilly.pulko@harmonychildrensvillage.com with your thoughts! Loving my children feels as natural as breathing. It's so fun to see how each of them is different and to discover their individual quirks. For instance, my oldest daughter, Jane, is always hot. She stopped sleeping in footy pajamas when she was 12 months old because she clearly felt uncomfortably warm in them. Even now, as a silly 7-year-old, she tries to get away with wearing shorts during the winter. On the other hand, Violet, who is 4 years old, wears a second layer of cotton pajamas under her footy pajamas and also wears footed tights year-round. Noticing these special things about our children is part of being parents-- and it's stuff like this that makes me reflect on how each and every child has special needs of their own according to a lot of things-- their genetics, their preferences and their personalities. They may or may not sleep with a paci, or only drink from a particular bottle, or have a food allergy, etc. So if a child also needs physical therapy for their development, or has a feeding tube, or has a rare genetic condition, sure, we can call those things special but the majority of their needs are the same as all of their peers: loving caregivers, a safe environment, quiet nap times, healthy habits, educational activities, and friends to play with. So for anyone telling your friends about Harmony Children's Village and trying to find the words to describe what makes us unique, my go-to phrase is "care for children with and without medical conditions" since every child has special needs, but not all of them have medical conditions. I have really enjoyed caring for three different babies so far in our in-home babysitting service and it has truly been a joy to get to know each of them. Also, we have some exciting news to share-- another baby will join Harmony Children's Village in a few months because I'm pregnant with baby girl #3! I can't wait to discover all the special and unique things about her, and I'll be sure to share them with the village. I would love to hear your thoughts on special needs and how your children all have unique quirks. This blog is a new way for our village to keep in touch, so please comment and email me at lilly.pulko@harmonychildrensvillage.com with topics you would like me to address and anything about parenting that you would like to discuss! Inclusive early education and skilled nursing care for preemies, babies and toddlers. Copyright © 2017, Harmony Children's Village. All rights reserved.